Will China’s domestic demand play its proscribed role in the soft-landing “decoupling” scenario when/if American consumption demand falls along with GDP output in the next slowdown? Much of the Chinese economic public relations image rests upon the urban areas of only seven of its provinces/municipalities whose combined population is 306 million souls*. Six of these are highly urbanised and have grown thanks in large part to massive infrastructure and/or capital intensive investments. With nearly 40% of industry state-run that is perhaps not unexpected; and at least in urban centres it can be said that a form of consumption demand exists. Nonetheless, aggregate domestic distribution of goods has fallen since 1998; and the internal consumption market is, unsurprisingly, extremely fragmented. In rural China – 50% of the population - incomes are falling and are about 30% of the national average (which is $1,500 annually or $5,900 on a purchasing power parity basis). There are just too many farmers for what fertile land is available. The famed export performance of China too has unexpected characteristics: 90% of it arises from the efforts of foreign owned firms. There is a striking lack of contribution from Chinese enterprises. In sum, it is difficult not to conclude that the Chinese economy is dominated by urban and state-led investment projects (itself a function of huge domestic savings) of which its 7 most urbanised provinces/municipalities have been principal beneficiaries. Preparations for the 2008 Olympics are a case in point; and the economic benefit from such investments has been ultimately mixed at best. Half the nation is rural and desperately poor; there is a distinct dearth of significant homegrown companies; and the export sector (with its own linkages back into China's savings rate) is in the hands of foreign companies sensitive to final demand above all. Coupling? They must be considering proposing. China may be a great new market (and so it's been said for over 400 years) but investment–led internal demand hand in hand with dependence on exports has limits. The balance of probability says these will be exposed in the event of a significant US downturn. Interesting comments and data. 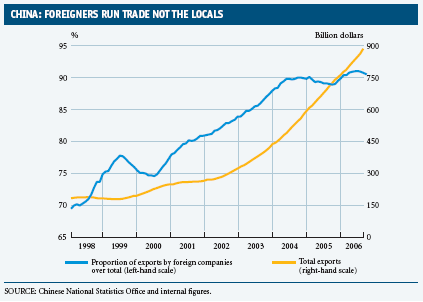 I had no idea that 90% of Chinese exports are controlled by foreign firms. Would it be correct to assume that you disagree with the Economist on this issue? In their October 21st edition, they argued that domestic demand in China (as well as India and Japan) would be able to offset any slowdown in demand from the US (The alternative engine). I can't contribute any original commentary (although I lean towards a pessimistic view of the China hype), but would be interested in your views of the above article. Kind regards and keep up the interesting postings. A big thanks for the comment, sentiment and the link. I do believe China is over-hyped and what I wrote was based partly on a lack of faith in the independence from the export sector of the Chinese consumer. Obviously, sheer urban numbers in China represent meaningful consumer demand; and it would be surprising were it not growing sharply given its low base. But it’s the G (especially) and NX components of GDP that have really powered growth. If “decoupling” means weathering the storm of a limited American recession China can do that to some degree thanks to G. So I agree that much with the Economist. Obviously, G won’t dry up if the US economy hits a slick (although post Beijing 2008 one impetus for it will go). These outlays then become a significant potential mitigating factor to declines in C, I and NX. However, if “decoupling” means being able to laugh off a US hit and go on reasonably normally thanks to a diversified and balanced economy I disagree. In an economy where 40% of gross (thanks, Economist) GDP is exports, domestic urban employment and - by extension – incomes and private consumption will sustain a lot more than flesh wounds if the number one customer goes MIA. Sustenance via G becomes a timing issue in this event, until C (ie the US) recovers. That does not look particularly problematic (even considering linkages between G and the other GDP components) until the existing issues of over-investment in several key sectors/industries are taken account of. Steel is an excellent example of one such. Politically it is very difficult for the Chinese Government to dissuade steel producers from producing (and they have been trying spectacularly unsuccessfully for 5 years) given generous liquidity and, more importantly, the quantity of those employed by steel. It might be China, but it is not that easy to sack workers en masse. The result is inventory building, which can only go on for so long, until the bubble pops. Finally in broader “Asia” terms if there is a block of consumers ready to step in as a pure potential “offset” to the US spending it is Japan. But the jury is (still) out on the recovery there. Thank you for your response. I'm not an economist, so I appreciate you breaking the argument down like that. until the existing issues of over-investment in several key sectors/industries are taken account of. I found your Baltic Dry Index post in September a good overview of the over-investment situation in the steel industry. Having read an article in the March 2006 edition of Foreign Policy (Dark Side of China's Rise), I was aware of the general situation, but didn't know any specifics. Here in Vancouver, the provincial government is anticipating continued huge imports from China into North America in the coming decades. As part of a so-called "Pacific Gateway project" ports are being built out and deepened, highways simultaneously widened and reinforced, new bridges built, etc. But the jury is (still) out on the recovery there. Things did look so promising in 2005. But now... Do you know of any good sources of info on Japan? JO, thanks for the comments and that link, really informative. Not sure if Mr Pei is a welcome guest in Beijing any more though. I had a read about the Pacific Gateway Initiative also. I hope there's work to push Canadian goods and services the other way with equal enthusiasm. Can't provide many links on Japan. However, I do read the blog "Cassandra does Tokyo" whose anonymous author is a finance pro / economist with deep Japan knowledge, a well of scepticism and a frequently entertaining writing style (frustrated novelist, possibly). His stuff leads me to think Japan equities, at least collectively, deserve cautious optimism. "Asian Bonds Online" is also highly informative but dry - the price of not writing under an assumed name perhaps. Not sure if Mr Pei is a welcome guest in Beijing any more though. Mmm...here's hoping he's comfortable in the US. I hope there's work to push Canadian goods and services the other way with equal enthusiasm. It's the old story with Canada (and especially BC). Raw materials out, manufactured products in. Chinese imports to BC are already worth 3-4 times exports heading the other way. Forestry makes up 50%, followed by coal (!) and food at 10% each, and then some metallic cocktail of gold/zinc/copper/moly., etc. Iron ore is also a significant export (hello BDI). Services? Err, do video games count? Yes, I discovered Cassandra a couple months back thanks to your site (which I was introduced to thanks to the Big Pic.). A good read. Regarding Japan, it's the "relative cheapness" aspect of his argument that makes me hesitate a little (he does lay out the pros/cons quite extensively). Calls to mind the phrase "damning with faint praise". In any case, it certainly bears some further research. I'll check out ABO, thank you.